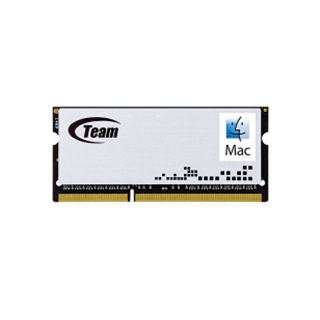 Products – Memory – Mac SO-DIMM DDR3 – Team Research Inc. The new Mac SO-DIMM is a breakthrough with a design of SO-DIMM in conjunction with heat sink, which is seldom in the market, such that not only chip can be protected from collision, but also excessive heat can be dissipated rapidly and efficiently to provide more stable operating environment. Together with aluminum material and extreme-light ultra-thin heat sink, it corresponds to Macbook / Macbook Pro skillfully, and leads memory to be light. Team Mac inherits Team Group with respect to consistent insistence on quality by using memory grains screened and tested by Team Group strictly, such that pretty excellent operating performance is shown. In addition, various capacity designs are promoted intimately to meet endless upgrade requirements of users for one time upgrade accomplishment.